We are currently at St. Edward’s University setting up for their Festival of Lights!! It’s that time of year again! We are currently at St. Edward’s University setting up for their Festival of Lights!! ‘Tis the season! Happy Thanksgiving! We are So Thankful for Our Families, Friends, and Wonderful Customers! Awesome copper rain chain just installed on a recent install! Getting ready, wrapping and testing holiday lights for St Edward’s Festival of Lights! For installation on this weeks project, a 1,200 gallon rain tank! Boulder staircase and retaining walls going in for this Circle C home! After completing pool construction several years ago, these home owners wanted to extend the functionality of their existing limestone pool deck by adding additional lounging space and increasing the outdoor living area. Built into a hillside in bee caves Texas, we used natural stone materials locally sourced to extend the existing outdoor pool patio and build a custom outdoor kitchen. 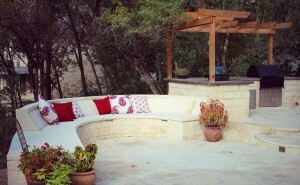 The patio includes an 18 foot built in stone bench designed for lounging by the pool and sun bathing. The kitchen features custom pored concrete countertops, a “big green egg” grill, 32 inch cooktop, and a custom cedar pergola for shade. See the progress of this project on our blog! Our fountain froze over night!